Last Friday I attended the IKEA + You Housewarming event. For the first time ever, IKEA interior designers worked with local families around the country to put IKEA solutions to practice in real living rooms. It was part of a competition where the lucky winners in each state received $5,000 worth of IKEA products to transform their living space. Lucky families! The IKEA + You initiative was born from the desire to inspire Australians to find happiness in, and live a better, everyday life at home. Some of the biggest frustrations faced by Australians, as most of us can attest to, is how to work with an open plan layout, how to get a coordinated look, how to personalise a space and how to conquer storage and clutter. Oh, that dreaded clutter! 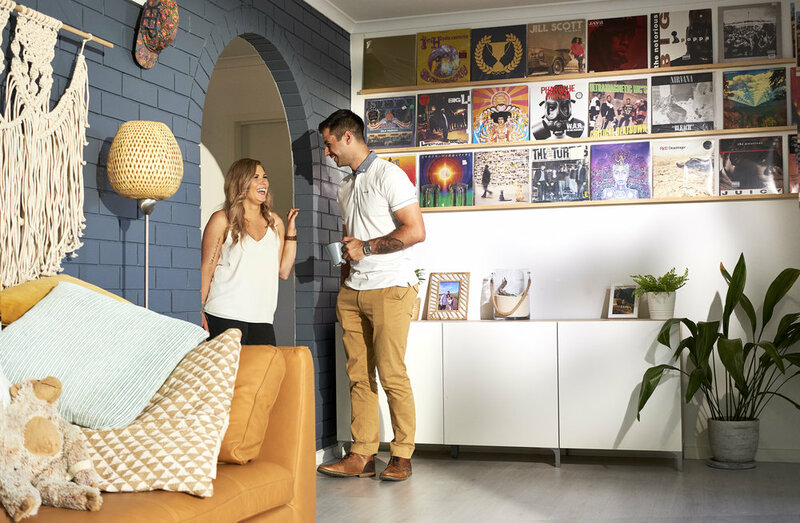 In South Australia, the IKEA interior designers worked with Lauren and Josh from Hallet Cove to find out what frustrated them about their space and how they could make their living room dreams a reality. Check out the BEFORE and AFTER and the 5 DIY tricks of the trade that transformed this living room from drab to fab! Lauren and Josh had a beautiful neutral base to work with the lovely Boho Scandi vibe in their house which allowed IKEA to have fun with bursts of colour. From sea shells to macramé hangers they have their own unique style. Don’t hide these things away! Favourite trinkets and collectables add character and spirit to the space. They tell a story of who lives in the space. To pull the room together and create a harmonious look, IKEA played with interesting textures and colours. They framed beautiful pieces of fabric and added them to frame galleries to add interest and depth and popped them all around the room. The beauty in this solution is that not only is it super simple to do, but really affordable! IKEA also updated some of Laurens favourite cushions, giving them new life with some fun pompoms in bright colours that tied in with the rest of the room. Moving away from the traditional wall shelf used to stack frames really helped to bring to life this fantastic brick wall. IKEA opted for wall hooks to show off Lauren's amazing handmade items. The KUBBIS rack is only $19.99, so it’s a really affordable and easy way to transform the wall. Plant pot hangers were woven together to incorporate some greenery into the look, and it’s now a great spot for accessories like Josh’s hat! While plants and greenery may not always make your space feel bigger, there are other benefits for ‘bringing the outside in’. Plants and greenery can help connect or pull together your space and help bring ‘calmness’ into your home. The best thing about this solution is you can easily change up the look on the daily, weekly, seasonally or whenever you feel like it. Lauren and Josh don’t like too much clutter, but when you have a living room that is used for playing, office work, relaxing and getting the kids ready for the day, it’s a challenge to keep the untidiness to a minimum. The solution was to create dedicated areas for kids and adults to help zone off the living room. Lauren and Josh now have their own customised wall mounted computer station using SVALNAS. It is incredibly compact and still fits in with the aesthetic of the room, so Lauren can watch the kids as they play while she gets on with her work. For the kids, IKEA created this incredible tepee with IKEA fabric and provided a nook in the corner for toys, nappies and kids blankets. It is important to keep it low to the ground so the kids can reach their toys and also have access to the storage so they can put their toys away! IKEA have successfully done what a lot of people are often afraid to do (me included). They have created a soft, welcoming and playful space for the kids and parents to gather by layering two soft rugs with coordinated colours and complimentary patterns. The key here is to work with a similar colourway where the two rugs complement, not clash. IKEA have paired this with a gorgeous tan leather sofa (which is easy to wipe sticky kiddy fingerprints off!) from the STOCKHOLM collection to complete the look. Don’t be afraid to put your things on display! The trick is to put your belongings or accessories into groupings by pulling together objects that are alike. This will help create symmetry and balance within your space. In this space IKEA have grouped together Lauren and Josh’s vinyl collection to create a gallery wall. The gallery wall is incredibly sleek and stylish and allows you to create an ever-changing feature that shows off your personality. This look adds personality, without looking cluttered, love it. In a first of its kind, IKEA has replicated this family’s living room in store, highlighting the solutions and creative ideas that the interior designers used in the space. Customers can learn how to solve frustrations that are truly relevant to their and experienced in homes in their neighbourhood. You can view it in store now in Adelaide. It’s worth the visit because it really does show you how to find solutions that can work for you, in your own home. IKEA + You can be viewed in stores and online now. * Blog post is not sponsored, just for the love of interiors!